A lot of people wring their hands about the disappearance of serious art these days, the fall of which they usually attribute to the sudden legitimacy of pop culture. 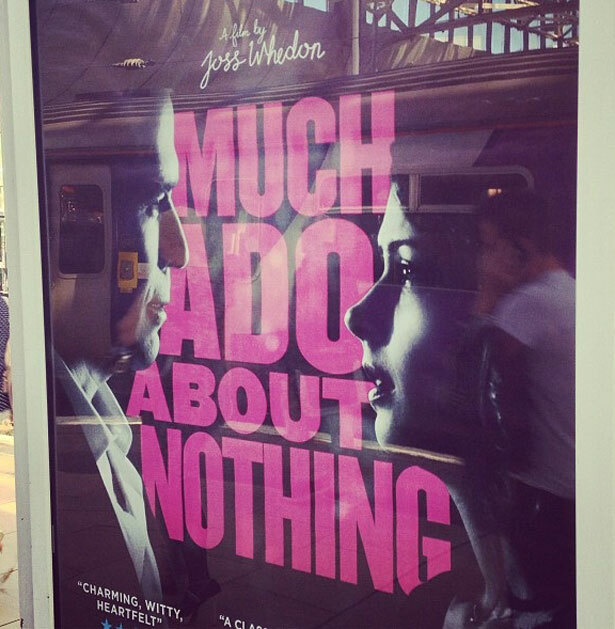 Joss Whedon’s Much Ado About Nothing, which opened last Friday, is a pretty good counterpoint to that argument. It’s a piece of “high art” which recommends itself chiefly on the presence of pop culture talent—and niche pop culture talent at that. Oh sure, there are snotty English professors somewhere, I’m sure, sniffing that Much Ado is the Bard’s minor work, a flimsy little comedy about nothing, which is why these people can handle it. But they are wrong. That not everyone is going to know what I’m referring to there could be seen as saying a lot about The Way We Do Culture Now, as an Awl slug might put it. Joss Whedon’s is a peculiar talent, one I can’t see succeeding in an age before this one. His expertise is in mixing pop culture memes and references. Granted, the way he tosses them up is always an exercise in joy. (And yes, I say this in spite of his habit of making the audience love someone he’s just about to kill.) But you usually have to be somewhat in the know of what he’s talking about to “get” him. And sometimes even the most devoted fan won’t. In that sense, I will cop here to not having been a particular fan of Whedon’s most recent production, The Avengers, which was made for a greater Marvel Comics kind of nerd than I personally am. The only piece of him in it that I truly recognized was in the comic timing of a certain Hulk Smash—the rest all too in-jokey for the likes of me. But I felt bad criticizing the film on that level; it’s not that I’m averse to pop-cultural in-jokes. Buffy and Angel were like quasi-religious texts to me, for reasons I won’t bore you with. The result is that I am able to, say, sing through the entire musical episode from memory. I have been known to sing to myself, as I leave the house in the evening, “Every single night, the same engagement.” I have firm opinions on which are the best seasons (second in terms of plot arc, third in terms of consistently good episodes). Also, if you give me a plot point, I can usually tell you the season and episode number. It’s just how I roll. But for a long time I was the only nerd in the room doing this. No longer. Now that we are all on the Internet, and can all lose days to binge-watching old television shows on Netflix, my kind is pretty much legion. The “pure” fans of Shakespeare? Much less so. There are days, of course, where I worry about drawing that kind of cordon around the world. When I write about certain prestige cable shows, or some art house films, I know they have tiny audiences who all talk to themselves in prestige publications. The sections of the overall pie get even smaller if we start talking about books that are not written by Dan Brown. And if I let myself think too far down that path, I become, in the name of nothing less than leftism, one of the fuddy-duddies I opened this post with. My brain starts asking how on earth we can have a cohesive society if all of our dream-life—because that’s what the culture is, our dream-life—is running off down different, and often mutually antagonistic, roads. I don’t really care about whether the culture is “serious art,” of course, but I do worry about no one being in the same room. But the thing I keep coming back to is that the cat is out of the bag there. All the people worried about the disappearance of a common canon are wasting their time trying to coax it back out from under the bed. And that’s not even to mention that that canon is old and mangy and racist and sexist and heteronormative and on down the line. It’s not that we have to put it down, of course—just feed it better, and let it get outside more, have a little fun. As I said, after all, it’s not just that Much Ado About Nothing is good; it’s that it’s pretty good Shakespeare. Especially the part—and here I won’t spoil you too much—where Whedon expertly parries one of those egregiously racist Shakespearean lines by framing the shot in just the right way. Republican Congressman Peter King is going after Glenn Greenwald. Read more about his attacks on the freedom of the press here.